Cairns’ Outer Great Barrier Reef Cruises are an excellent choice for singles, couples, families with older children and adventurous travellers. The Great Barrier Reef system is comprised of more than 2,900 individual coral reefs. Each day more than 30 trips depart Cairns: you can choose between sail boats and fast, comfortable catamarans. Activities available include snorkelling, introductory diving (no experience necessary) and certified scuba diving. The boat size varies, pending the operator, so you can escape the crowds and tailor your day to suit your interests. Although each of these Great Barrier Reef tours offer different destinations and experiences, there is one main choice to make when selecting an outer reef cruise. Do you want to take a cruise that visits a pontoon or not? What’s the difference? A pontoon trip allows you to leave the boat and enjoy shaded seating and meals on a permanently anchored pontoon. Non-swimmers will enjoy a pontoon trip, thanks to the range of above-water activities. A boat trip takes you to and from and the reef, visiting between two and three different reef sites (pending the operator) with water entry directly from the boat itself. These trips are not recommended for non-swimmers. Pontoon trips are generally more expensive, but have more inclusions: boat trips are cheaper and allow you to visit more reef sites. More on this as follows. Cairns Outer Great Barrier Reef boat trips are generally cheaper than the outer reef pontoon trips. Travel time is generally between 90-minutes and 2-hours and you visit at least two different reef sites during the day. Each operator has different moorings; some of the reefs you may visit include Saxon, Hastings, Paradise, Milln, Moore, Flynn, Thetford, Sudbury, Channel and more. All are within the Great Barrier Reef Marine Park and World Heritage Area. Inclusions on these trips vary. Some boats have glass bottom boat tours, some offer guided snorkelling and some do not. All trips include lunch and complimentary tea and coffee on arrival. These trips are suitable for snorkelers and divers and allow you to explore the Great Barrier Reef in the open water. These trips are not suitable for non-swimmers. 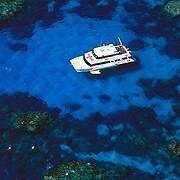 Maximum water depth is generally around 30m and coral gardens come to within metres of the surface. You can expect to see colourful corals and many different types, shapes and sizes of Great Barrier Reef fish. Cairns’ Outer Reef Pontoons provide the perfect day tour for families, non-swimmers, motion sickness sufferers, the elderly, mobility impaired visitors and people wanting a variety of reef activities in the one tour. Why? All three of Cairns’ outer reef pontoons have child friendly swimming enclosures and provide child-sized wetsuits and snorkelling equipment. The boats and pontoons are pram friendly and some even have change tables. Non-swimmers can partake in a range of Great Barrier Reef experiences thanks to glass bottom boat tours, underwater observatories, marine biologist presentations and semi-submersible vessels. Pontoons are more ‘stable’ than boats. Their larger size and sheltered anchor positions make them more like being back on land, giving motion sickness sufferers a chance to get off the boats. Swimming, snorkelling and diving are all easily enjoyed from platforms, with access to calm waters. When not exploring the Great Barrier Reef, relax on sundecks with comfortable lounges. The Outer Reef Pontoons offer a variety of activities. Guests can swim, snorkel, scuba dive, partake in glass bottom boat and semi-submersible tours, visit underwater observatories and marine touch tanks, relax on sun decks, get changed and have a freshwater shower before returning home. Three Cairns Great Barrier Reef day tour operators have permanently moored outer reef pontoons, Reef Magic Cruises, Great Adventures and Sunlover Cruises.